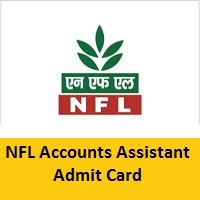 NFL Accounts Assistant Admit Card 2019 Is Released: As of now, National Fertilizers Limited (NFL) is planning to release the NFL Accounts Assistant Hall Ticket 2019 for the online assessment test. The Exam Date is 17th March 2019. The candidates who have applied can download the Hall Ticket from the official NFL Accounts Assistant Admit Card 2019 @ nationalfertilizers.com. you can also get your hall ticket through the links mentioned in our webpage. And also for the candidates who have no idea about how to download the Admit Card, we have furnished you with the sequence of steps for NFL Accounts Assistant Hall Ticket 2019 Download. We also provided you the Selection Process NFL Accounts Assistant and necessary documents to carry. It is to inform all the candidates who have applied for the posts of Accounts Assistant at National Fertilizers Limited, that the admit card of the online assessment exam has been ready to upload by the governing body. As per the official notification, the online examination for the above posts will be commenced in March 2019. Candidates are advised to download their NFL Accounts Assistant Admit Card 2019 before the exam date in order to skip the hurry at the last minute. NFL Admit Card 2018, candidates have to take a print out of the NFL Admit Card 2018 in an A4 page and we advise you to carry it along with other particulars like Original Photo ID Proof which are mentioned below at the time of examination. The candidates are expected to follow and maintain the rules of the exam hall during an online assessment test as mentioned in the NFL Accounts Assistant Admit Card 2019. The initial stage for the NFL Accounts Assistant post is Written Examination. On the basis of the online assessment test, the provisionally qualified candidates based on the merit list will be requested to produce original certificates along with one set of photocopy for confirmation purpose. The shortlisted candidates from online assessment test will be called for the personal interview. The candidate’s identity will be verified with respect to his/ her details on the call letter and in the Attendance List. If the identity of the candidate is in doubt the candidate will not be allowed to appear for the Online Examination. Note: Candidates, to qualify in the Personal Interview separately with a minimum average of 50% marks in interview. In order to download the NFL Accounts Assistant Hall Ticket 2019, the candidates have to perform these sequence of steps, Move on the official website of National Fertilizers Limited (NFL). Search the link related to the login page and click on it. the login page will display on the monitor. Fill the necessary fields in order to log in and click on submit. Now tap on NFL Accounts Assistant Admit Card 2019 Download. Once the NFL Accounts Assistant Hall Ticket 2019 is displayed on the screen, Click on the Print /Download button to save a copy of the admit card. Even after the online assessment test, candidates should keep a copy of NFL Admit Card 2018 (Soft or Hard Copy) for further references. ★ Candidates are requested to log in on Apply Online link for downloading Admit Cards for the Online test to be conducted on 17th March 2019. All the Candidates they Can check their National Fertilizers Limited Accounts Assistant Admit Card 2019 with the help of details mentioned in this article. For more other details keep visiting our website Fresher Now regularly. If Candidates have any query in your mind you can Drop Your Comment In Comment Box without any hesitation. we are trying to give back proper Response Shortly.